My Documents, Username's Documents and the My Documents folder in the Documents and Settings folder all relate ... intimately. In "My Computer," I have a folder "My Documents" - 12.9 GB, 11.7 GB size on disk. I also have a folder "Robert and Brenda's Documents" - 12.9 GB, 11.7 GB size on disk. Then there is a folder "C:\Documents and Settings\Robert and Brenda\My Documents" - 12.9 GB, 11.7 GB on disk. 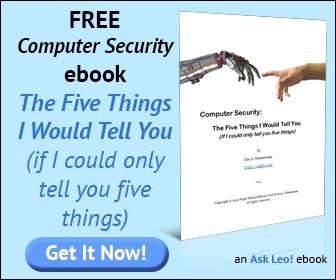 And of course, like you, I have "C:\Documents and Settings\LeoN\My Documents" as well. "... three names for the exact same thing." By now you've probably guessed: three names for the exact same thing. So, no, in your case you're not taking up 36 gigabytes, it's only the single 12.9 gigabytes being reported in three different places. Delete something in one place and you'll see it disappear from all three. Good question. As I said, it's Windows trying to be helpful. 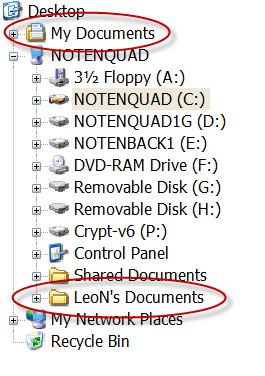 "C:\Documents and Settings\LeoN\My Documents" is the official and correct location for the folder, but it's also cumbersome. "My Documents" is a convenient shortcut, nothing more. In fact, it's something that programs can count on, so that they don't have to know that when they're on your machine it's "Robert and Brenda", and on mine it's "LeoN". They can just reference "My Documents", and they'll get the correct folder for the currently logged in user. "LeoN's Documents" is a little harder to rationalize, but on a system with multiple user accounts, each would likely have a named shortcut so that files could easily be exchanged as desired between users. It is also possible to redirect where Windows XP sends 'My Documents'. I prefer to partition my Drive and store Data on drive E: . To do this, right-click on the My Documents folder and select properties. Here you can change the Target Location folder. You can also change the Store folder for your Outlook Express e-mail messages to your data drive as well. ( Tools > Options > Maintenance tab > Store Folder. This has the advantage that if I get a pesky hard-to-get-rid-of virus or malware, I can easily restore my C: drive image and not lose any recent documents. I have not figured out how to redirect the Address book nor Favorites, so simply copy them to the E: drive occasionally. "E" drive is the folder that you have ready to burn to a cd. Why would you you send folders to that place to store them? I normally set a hard drive up with 5 or 6 partitions. C for the operating system, D for the program files, E for Data, F for photos and G for back-up images. BY the way, Leo explains a much easier method to change the location of the "My Documents" folder. search Leo's database for " change my Documents location "